I adapted this recipe from South Your Mouth blog. 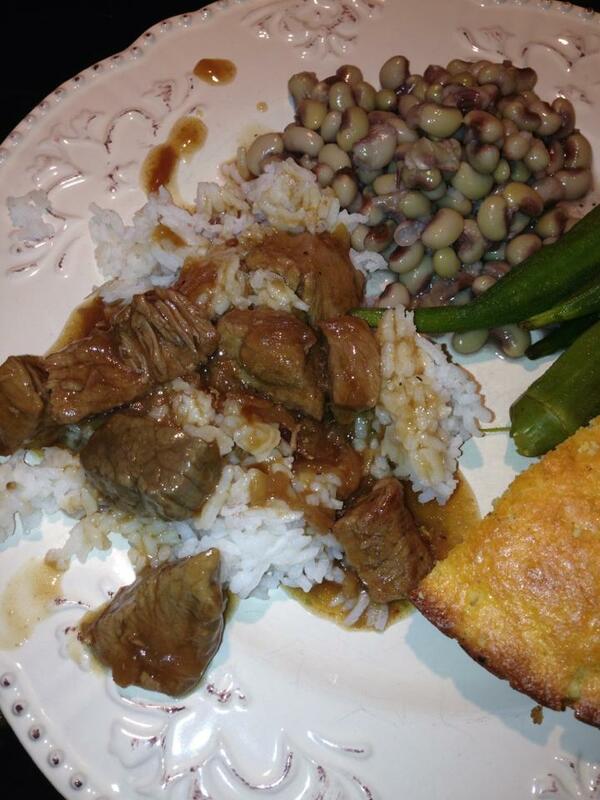 She calls this dish Stewed Beef and Rice, but around our house we call this beef tips and rice. This is yet again, a dish I had never had before I started dating Big Daddy. Now, with both of my parents being from Avoyelles Parish, we had rice and gravy several times a week. And beef, pork, grillades, smothered chicken would be the main course with the rice and gravy coming right along with it. Beef tips aka stewed beef are not the same thing. The gravy is thicker and I find the flavor to be a little more concentrated. It would definitely be filed under comfort food and if you have never had beef tips and rice before, it really should be on your list for this week or next. It’s that good. Oh yeah…they are as good as they look. For a long time I kind of made do with some packaged gravy mix and some stew meat. Then Mandy at South Your Mouth made my world a better place by giving me an official recipe that does not involve a packaged gravy mix and I did a happy dance. Definitely work a little extra effort, and truthfully, this is a pretty simple recipe. I hope you will give it a try!! Heat oil in a stockpot over medium heat. Season your stew meat with salt and pepper. Throw the seasoned stew meat into the skillet and give it a good stir once or twice. Your goal here is to get the cubes of beef nice and brown on all sides. This takes about 4 minutes. Remove the meat with a slotted spoon and put it in a bowl, set aside. Meanwhile, back at the stock pot, whisk together the beef broth, soup mix, and 1/2 cup of the water. Stir in the stew meat and cook over low heat for about 1 1/2 hours. Do not let the pot reach a full boil or your meat will get tough. After the meat has stewed in the liquid for about an 1 1/2 hours, remove it with a slotted spoon and set aside. Raise the heat under your stockpot and bring the broth mixture to a boil. Add cornstarch to a small bowl an whisk in remaining 1/2 cup of water until smooth. Pour cornstarch water into broth, bring it back to a boil and cook, stirring constantly for about 1 minute. Reduce your heat to low. When the liquid has stopped boiling and has thickened, put stew meat back in the pot and give it a stir. Let the meat “stew” (I guess this is where this dish got its name from…whole lot of stewing going on) in that flavorful liquid for about 5 minutes. Serve over white rice. (And if you are country, or married to a country boy like me and therefore country by marriage ha ha serve alongside homemade cornbread, purple hull peas and boiled okra (when in season) and of course sweet tea. It really is so very good. Could this recipe be made in the crockpot? If so, how would you do it? I wanted to thank you for these beef and rice tips. You mentioned that for this it’s important to show the stew meat into the skillet and stir it once or twice. I’m curious to learn if you could use other types of meat and if it can affect the recipe in any way.